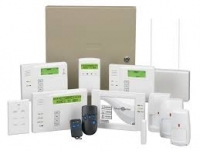 DSC Security Alarm Installation Kit - Alarvac Systems Inc. Your DSC Power1660 Security System has been designed to provide you with the greatest possible flexibility and convenience. Has Hardwired and Wireless zone capabilities to meet all needs. Now Network enabled providing email and txt alerts directly to your phone. Home automation capabilities including climate control, light control,door access and appliance control features as well as integrates with CCTV or IP Camera systems.